This will be the first of an estimated 26 mid-season report cards that we will be putting together here at the BBB as we prepare for the All-Star break. The purpose of these assessments are to provide grades to each notable Yankee at the midway point of the season. We will be handling these alphabetically, therefore making Dellin Betances the first player on our radar. 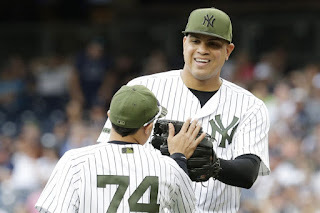 Betances has continued to pitch at the dominant level that us Yankees fans have become accustomed to since his arrival to the Bronx a few years ago. On track to make his fourth consecutive All-Star appearance, Betances seamlessly filled in at closer during Aroldis Chapman's DL stint, and has been an integral piece at the backend of the bullpen. Betances has done his best this season to make team president Randy Levine eat his words. During a tense arbitration battle between the Yankees and their star home grown reliever, Levine foolishly compared the prospects of Betances being paid like a closer (though he was only asking for $5 million) to himself being an astronaut. Such an analogy is not only inappropriate for the sake of the argument Levine was attempting to convey, but it was also an insult to a player who has been one of the best relievers in baseball over the past four seasons. He may get erratic at times, and be one of the easiest pitchers in the league to steal off of, but his pros far outweigh these minor cons. In 27 appearances this season, Betances has pitched 24.2 innings, allowing 12 hits, walking 16, and striking out an impressive 47 batters. His 1.09 ERA and 1.14 WHIP place him amongst the most elite relievers in baseball. As of late, the Yankees bullpen has devolved into an unmitigated disaster. Amidst this collapse, Betances has remained one of the few reliable arms manager Joe Girardi can call on in a big spot. Granted, Betances has not pitched much these past few weeks due to the Yankees sudden downward spiral. He did also struggle in a recent appearance against the Los Angeles Angels at the Stadium. However, that can likely be attributed to Betances' lack of use. When big money closer Aroldis Chapman landed on the disabled list in mid-May, the Yankees did not miss a beat. Part of this success should be credited to the stability Betances has been able to provide at the backend of the bullpen. With Chapman back, and the rest of the relief corp continuing to struggle, Betances becomes even more valuable in close games. With Tyler Clippard getting bombed almost every time he takes the mound, Adam Warren on the DL, and other middle relievers struggling, the Yankees will have to get bullpen reinforcements if they intend on competing in the second half. Heading into the season, the bullpen was expected to be the team's biggest strength. A common saying that we'll often hear is, "The best-laid plans of mice and men often go awry." The Yankees bullpen presents yet another example of this phenomenon. The Yankees may not have not have played in many close games as of late, but that will most definitely change. As the season goes on, and the games become increasingly more important, Betances will be counted upon to get big outs. This is nothing new for Betances. Ever since 2014, the Washington Heights native has led the team in relief appearances, making at least 70 in each of those seasons. In a way, it may be a good thing that Betances hasn't had to pitch much in the first half of the season. This means he will not run out of gas in the second half, where he will become even more important. 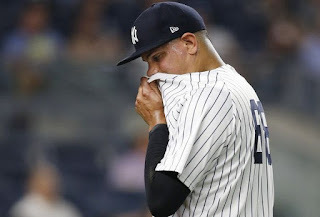 Following the trades of Chapman and Andrew Miller last July, the Yankees placed an over-reliance on Betances, and he seemed to have been running on fumes during the last few months of the season. Betances will be expected to dominate in the second half, and there's no reason we shouldn't expect for this to be the case. Dellin Betances has been, and will continue to be, one of the most important players on the Yankees roster. Though not the closer, Betances is more than capable of sliding into that role. In fact, most teams in the league would salivate at the prospects of having Betances close out games. Needless to say, if the Yankees plan on making the postseason, and going on some sort of run should they get there, Betances will be a big part of the reason why.